The Alaettin Mosque is from 1221. It is in fact one very large room, that at some points widens, at others narrows. The pillars (or at least their capitals) have been taken from Roman buildings. On the picture: The eight cenotaph sarcophagi on the first floor of the ‘Kılıç Arslan Türbesi’; most of them are adorned with glazed tiles (with white calligraphic inscriptions on a blue background). 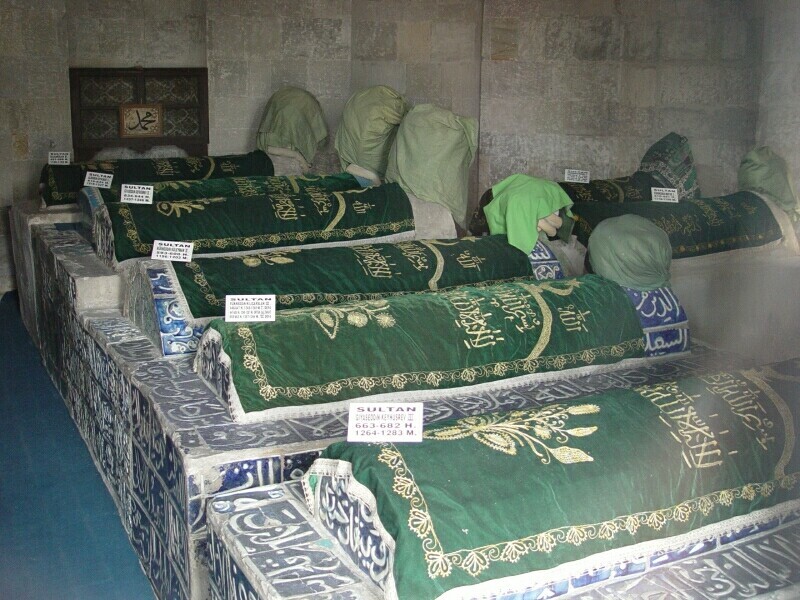 They belong to the builder of the tomb (sultan Kılıç Arslan II, 1156 - 1192) and to seven of his successors which reigned in the late 12th and in the 13th century. A cenotaph is an "empty tomb" or a monument erected in honour of a person or group of people whose remains are elsewhere. The word derives from the Greek: κενοτάφιον = kenotaphion (kenos, one meaning being "empty", and taphos, "tomb"). In general, a Turkish ‘türbe’ has two rooms: an upper room where the cenotaph sarcophagus/sarcophagi were placed to be visited by relatives and followers, and a room beneath where the remains of the deceased were buried. Sources: ‘Agon Cultuur reisgidsen’ – M.Mehling, 1989 & Website of ‘wowturkey.com’.